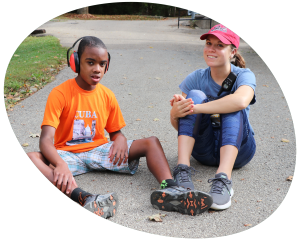 For 19 year-old college sophomore Katie Perry, witnessing ‘moments of victory’ with Stepping Stones’ campers was the stone that cast a ripple effect – inspiring her to major in special education. Growing up in Norwood, Katie first joined Stepping Stones as a volunteer at the age of 13. Upon graduating from Roger Bacon High School, she joined our summer staff team. Today, she returns home from her special education studies at Bowling Green University on the weekends for Saturday Kids Club and will once again be at day camp this summer. Each year, 140 staff and more than 700 volunteers create memories and make a difference in the lives of 400 individuals at Stepping Stones’ Summer Day Camp. For nine weeks, campers find pathways to independence, express themselves, make friends and have fun in a safe, structured environment. A summer camp experience at Stepping Stones launches a ripple effect that spreads throughout the community and lays the foundation for future career paths. Like Katie, many Stepping Stones volunteers and camp staff are inspired to pursue a college education in related fields. It’s a life-changing experience that launches careers in occupational therapy, physical therapy, special education, medicine and nursing. At Stepping Stones, Katie was paired with Sebastien. Working together one-on-one, the two developed a bond in Summer Day Camp and Saturday Kids Club that has helped the 12-year-old boy with autism blossom throughout the years. In watching Katie interact with his son, Sebastien’s father Marvin describes her as “heaven sent”. 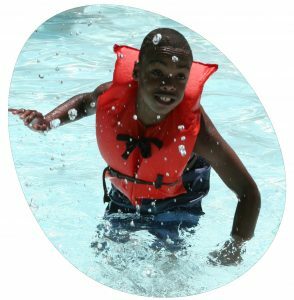 Stepping Stones’ Summer Day Camp provides an environment where every camper can enjoy moments of victory and every staff and volunteer can discover a passion that inspires future careers. This summer, we invite you to make a financial gift that will start a ripple effect and change the lives of countless members of our community. Thank you for casting the stone that will change lives!